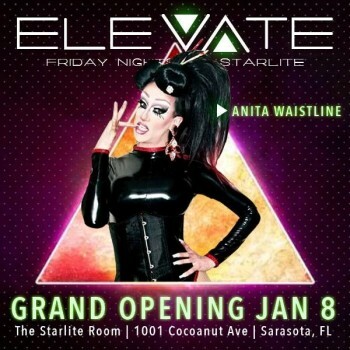 Sarasota – Locals searching for a new LGBT hot spot can elevate their Friday night experience at Starlite in Sarasota. Jan. 8 is the grand opening of Elevate – Friday Nights at Starlite. The night will kick off with a happy hour from 5:30 to 8:30 p.m. in the downstairs lounge, where guests can mingle while enjoying the sounds of show tunes on the piano. Joshua Beadle, event coordinator and owner of Beadle Media, says bottle prices will be lowered in hopes that people will socialize and share with friends. Bottle specials will include $40 Chandon champagne and $75 Stoli vodka. Joel Pozo will serve as VIP bottle service host. Beadle launched Elevate as a by-product of Ivory Lounge’s Cream Thursdays’ Dissolution. Beadle began Cream Thursdays when he moved to Sarasota in 2012 after noticing a lack of LGBT nightlife events in the area. He began G2H2: Gay Guy Happy Hour shortly thereafter. After Cream Thursdays ended, Beadle decided to start Elevate as a way for the Cream crowd to continue their fun. Beadle says he is also hoping to merge the older and younger crowds among the G2H2 group by appealing to the older crowd with a happy hour and the younger crowd with late night entertainment.